Let me know if everything worked out okay, and feel free to offer feedback! Thanks, guys! Let's boot this baby and see what's in store for me. I think I know someone who's going to get upset at that, normally Checkpoints are meant to be put on the ground. 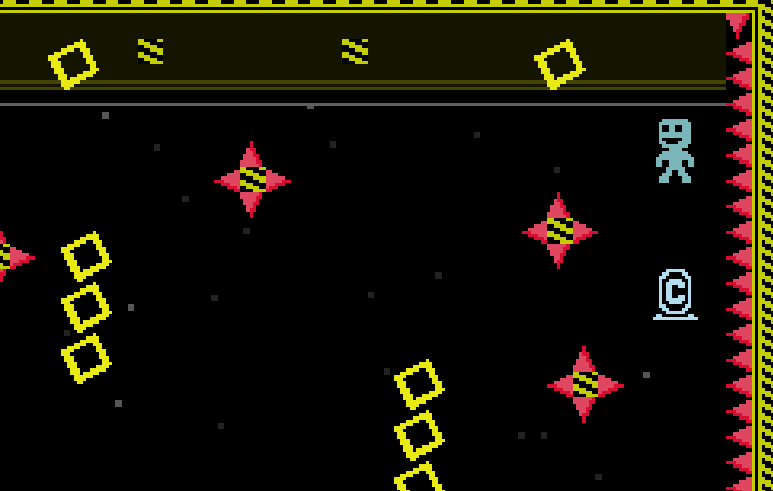 In the yellow stage, there is one checkpoint that WILL kill you as soon as you enter a WarpToken, since this room has no name, I can't really tell which one is. Interesting... I see why you put the Floating CheckPoints now. Oh no... let's keep going. Now here is something Funny I found. If you exit the room after getting the Trinket, the warps will dissapear, on the upperpath, Viridian will say "All Set Now!" then go down to the room on the right, come back , hit the warp and Viridian won't say the "Destrop Warm Token script"
Oh, jeez, I totally missed the fact that I left the upper part of the ending scene open. I'll fix that. I also move the checkpoints in the green levels onto the platform itself (they should still be hit when using the warp token, though). 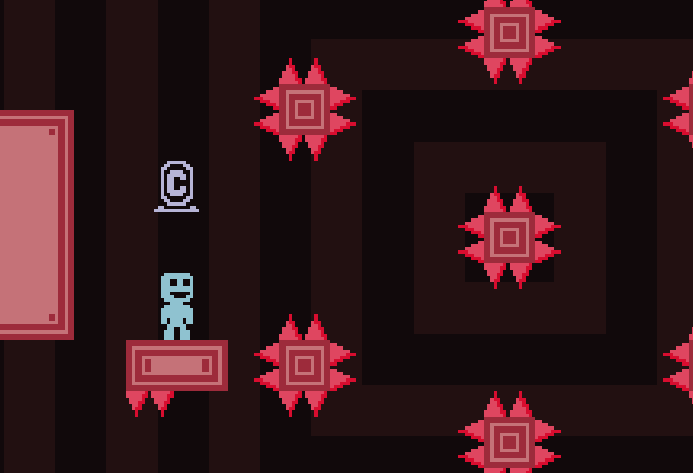 I also added a platform under the checkpoints in the purple levels, so it'll give people a little bit of time to gameplan. I'll go back and edit the first post. CHECKPOINTS ARE NOT SUPPOSED TO FLOAT, EVEN IF THERE IS A PURPOSE TO IT! WHY DO NONE OF YOU EVER LISTEN TO ME?! Did I mention it was too hard? So, it was an okay level - I liked the concept, but hated the design, and despised the difficult. Good luck in your future levels! Just played it. I liked this one a lot! The main concept is very clever, and very well implemented. I found it maybe a little on the hard side, but I appreciated that the build up of difficulty across the loops is actually integral to the concept (as opposed to just being arbitrarily difficult like a lot of other levels posted here are). I also liked your use of scripting - just enough to give the level some personality, but not so much that interrupts gameplay. - A couple of the blue rooms warped you directly onto a threadmill, which meant instant death! Which felt unfair. - There are quite a few places with single 1x1 tiles floating, or horizontal/vertical lines of tiles which can look a bit ugly - not a big deal, though. - Almost all of the red stage can be completed by just warping on the left at the start, which makes is pretty trivial to solve. Are you going to continue polishing this one up? I'll keep an eye for updates! Not true at all - function always trumps form, as far as I'm concerned, and it makes sense here to have the player start in midair with the restrictions imposed by the concept. Like Terry said, those checkpoints had a meaning, but they could be moved to not cause an unfair death. Might want to tone down the difficulty to a point where it still difficult but without killing you unfairly. give it a go and do your best! Well, checkpoints floating highly irritates me. Maybe turn it upside down and put a 2x2 block above it? I can understand your complaint, PJ - it does look a little strange to see a floating checkpoint. But sometimes they can't be helped. Particularly in the red section, it would undermine my intentions for those levels. The idea is that you have to complete the level falling downward, and just when you get the hang of it, that's when I put the platform in to force you to complete the level in the opposite direction. If the platform had been there the whole time, it would've made the level fairly more linear. And thanks for pointing out the glaring error in that red section, Terry - I had been meaning to fix that but never quite got around to it. I also fixed the conveyors in the blue section (but I think I'll leave the shortcut in the last blue stage - it considerably shortens the level, but it still presents a challenge to the player). I'm going to go back and see if there's a way to tweak the yellow section so it doesn't kill you straight out of a warp, but is still as challenging as I intended it to be. Thanks for all the feedback, guys! I'm going to continue fine-tuning it for now. Maybe when the patch gets released, I'll modify the script a little, as well (maybe to something on more of a fourth-grade level). I guess so. I do have an idea that might help it though - put the checkpoint on the bottom of a single conveyor tile, then put spikes on the top of it. 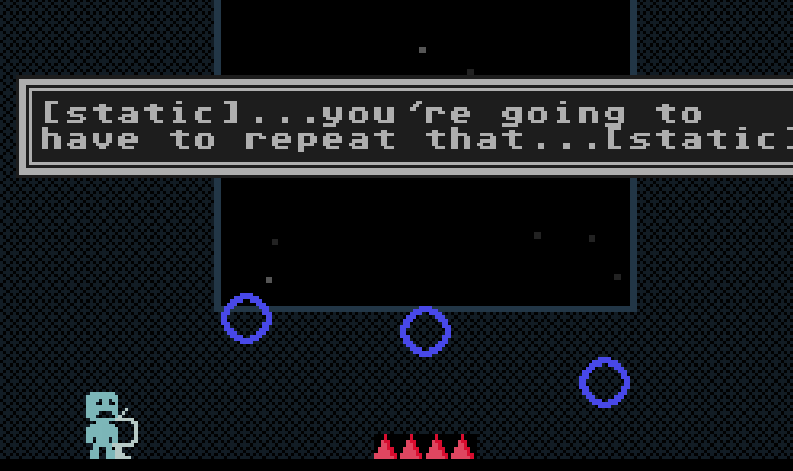 I was sorta hoping you'd update this level, but at this point I guess that's unlikely. Anyway, just featured it! Anyway, nice level! There were a few parts where the difficulty was a bit faked (like the purple level could have been given 2 checkpoints), some parts which were frustrating (like the end of the purple level having no checkpoint, but that was probably an accident), or it was easy to get round (every red level but the last one was easy to bypass). But overall, I liked it. Didn't care about the floaty checkpoints, but the 1 block-width lines were annoying. Whoa! I totally wasn't expecting that! I had worked on it a bit, but I got caught up working on Alphabet City and a new big one. Still, I'm psyched that you decided to feature this one. Eh, excuse me, we do NOT take shots at people on this forum! I have never put "too hard" on a story level!